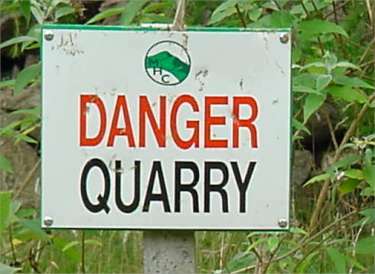 Use of the title 'North Quarry' clearly demonstrates the dangers of referring to the quarries by name. Other sources refer to the site as 'Scar Quarry', 'Scar Rock Quarry', 'Ivy Scar Quarry' or even 'Ivy Scar/North Quarry'. This confusion comes about partly because as stone was quarried over the years two large quarries merged into one and it is not easy to differentiate one from the other. For convenience the car park is called 'North Quarry Car Park'. The quarry that is immediately behind the car park is the North Quarry. The concrete blocks to the northvwere placed there to prevent loose stone from flying across North Malvern Road. There is a still a lot of loose stone and debris at this site so great care should be exercised. The Scar Rock (itself possibly the site of a small old quarry) is further to the south, a short walk away along the path from the car park. 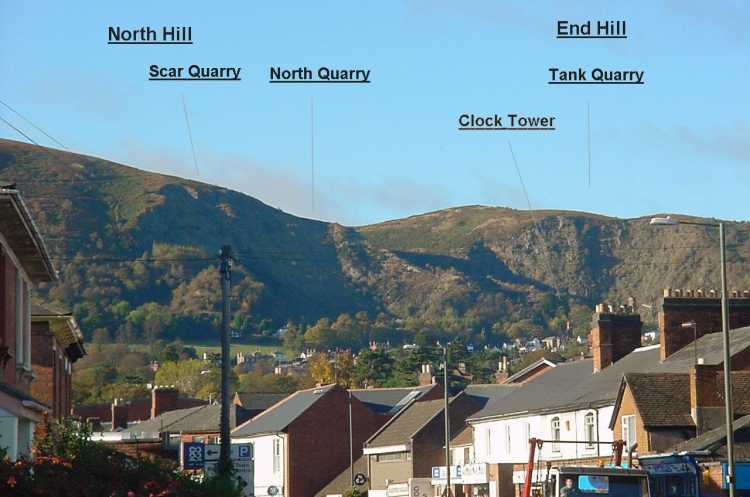 The photograph below was taken by Andrew Smith on 26th October 2002 to show the relative positions of the North Malvern quarries. The Pyx Granite Company Limited (who also leased a quarry at Little Malvern) obtained a lease from Duke Gandolfi to mine stone at Scar Quarry. The Malvern Urban District Council mined stone at North Quarry slightly further north whilst even further north was the quarry at the Tank worked by Mr T. Morgan. Amazingly, when the Malvern Hills Conservators sought powers to control quarrying in the proposed 1909 Malvern Hills Act one of the objectors was the Malvern Urban District Council. 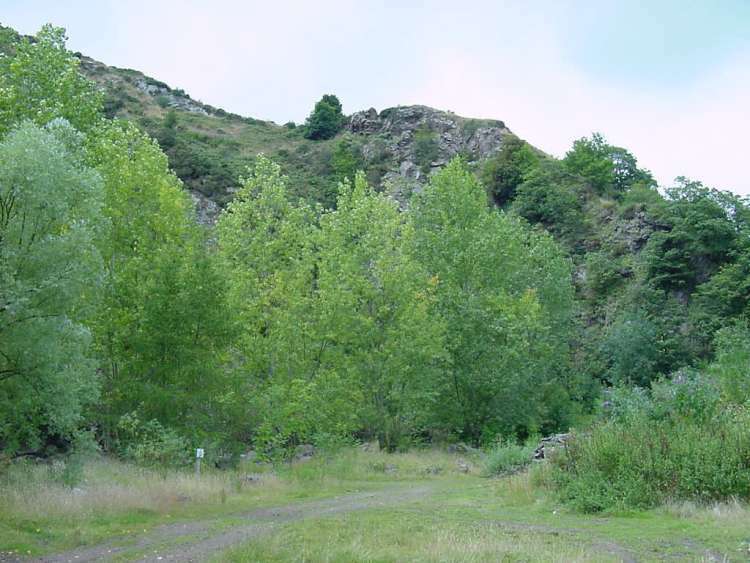 The proposal to control quarrying were eventually deleted from the 1909 Act and the Pyx Granite Company Limited and others were free to continue destroying the hills in the search for Malvern stone. Shortly afterwards the Gandolfi's sold the North Quarry site to Malvern Urban District Council and the Pyx Granite Company Limited acquired the Tank Quarry. By 1924, the Malvern Urban District Council had changed its mind and now supported the conservators desire to control quarrying. As a result the Malvern Hills Act, 1924 was passed giving important new powers to the conservators. Firstly there was the right to compulsorily purchase land on the hills (these rights expired on 31st December 1929) and secondly was the ability to raise a large sum by precept on the ratepayers for the necessary compensation payments. However, in return for not seeking a renewal of the Berington lease at Little Malvern, the Pyx Granite Company Limited secured the rights to continue to mine stone at its quarries at Scar and Tank until June 1960. Furthermore as part of the deal, the Pyx Granite Company Limited also acquired from Malvern Urban District Council a lease on the North Quarry. This gave Pyx control over all of the quarries on North and End Hills. The North and Scar quarries eventually merged into one site. The enlarged quarry on North Hill closed in 1960 and the site has been largely restored and planted with fast growing trees. However, it was a large quarry and the workings reached high up towards the top of the hill. Visitors are not encouraged to access this site but should instead park in the car park and follow the footpath round the hill in a southerly direction where they will be rewarded with spectacular views over Worcestershire as far as the Cotswold Hills. By continuing to walk around the base of North Hill (past Ivy Scar Rock) you will eventually reach the tranquil resting place of St. Ann's Well where you can sample Malvern water. It was here that a famous personality 'Blind George Pullen' played the Euphonium almost every day for 50 years from about 1880. This is the quarry as seen from the car park. 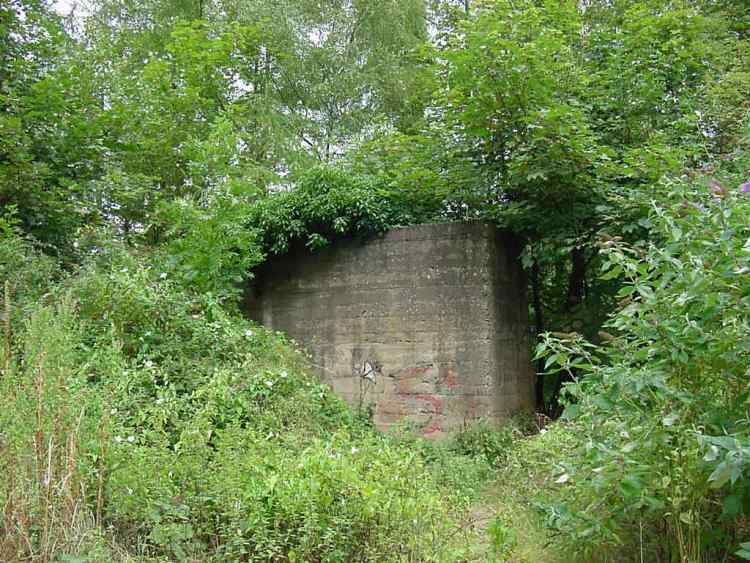 Hidden away amongst the recently planted trees at North Quarry are several large concrete blocks. The function of these blocks was to act as protection barriers to prevent falling stone from hitting pedestrians, cars or homes on North Malvern Road. Both of these photographs were taken by Andrew Smith on 11th August 2002.